This immaculate four-bedroom villa is located on the scenic Royal Westmoreland Golf Resort on Barbados' west coast. Accommodating up to eight guests in supreme comfort. 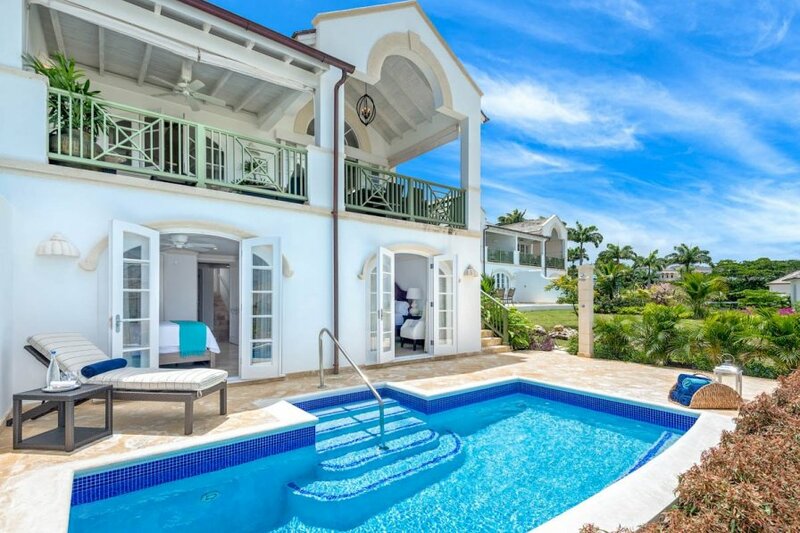 This immaculate four-bedroom villa is located on the scenic Royal Westmoreland Golf Resort on Barbados' west coast. Accommodating up to eight guests in supreme comfort, it enjoys access to the resort's beach club, tennis courts and fitness centre, and has its own stunning pool and terrace right outside. Offering plenty of privacy, the Royal Westmoreland Golf Resort is around nine minutes' drive from Holetown, with numerous beautiful beaches and bays lining the coast. The chilled-out beach club of the resort is at Mullins Bay, a calm and clean beach which is perfect for relaxing, with food stalls and bars nearby. The villa itself features a lovely elevated terrace with dining and seating areas, which offers beautiful views of the area. With step access, the pool below is great for an early morning dip, and there's space to settle on a poolside sun lounger for the rest of the day. The interior has been impressively designed, with high-quality furnishings and subtle decor. There's plenty of comfortable seating in the living area, and a kitchen and dining area share the same open-plan space. You have a flat screen television, breakfast bar, large fridge freezer and a host of other appliances, and there's direct access to the upper terrace. The bedrooms can be found on the lower levels of the house, each one of them air-conditioned and two of them en-suite. You have king-size beds in three bedrooms (one can be separated), and two sets of twin beds in the fourth. An additional bathroom is shared by the rooms without en-suite facilities. Westmoreland's sought-after location in the Saint James parish is within easy reach of the neighbouring parishes of Saint Peter, Saint Andrew and Saint Thomas, where you can enjoy excursions to the likes of Harrison's Cave, bustling Speightstown and the stunning Farley Hill National Park, with some of the island's finest views. Sugar Cane Ridge #11 is a 4-bedroom villa, split across 3-floors. From the terrace, guests can enjoy meals with an impressive view. The facilities at Royal Westmoreland allow paying guests to use a communal swimming pool, fitness centre, tennis courts and much more.